At the emergency meeting of the Arab League in Cairo, foreign ministers of the organization’s member states have accused Iran of intervening in the internal affairs of the region and of undermining national security. They also claimed that Tehran, if its provocations continue, might face “more active involvement” — in particular, possible lodging a complaint to the UN against the Islamic Republic. At the same time, diplomatic and economic confrontation of Tehran and Riyadh on the matter of the attack should not escalate into “the hot phase,” Saudi Arabia’s Defence Minister Mohammed bin Salman Al Saud stated in an interview for the newspaper The Economist. “It is something that we do not even forecast, and whoever is pushing towards that is probably off their head, since a war between Saudi Arabia and Iran would trigger off a major regional catastrophe, which will have a great impact on the rest of the world. For sure, we will allow no such thing,” the Saudi Minister of Defence replied to a question about the possibility of a direct armed conflict flaring up between the two countries. While commenting on the execution of 47 Shia clergymen, including the venerable preacher Nimr al-Nimr, the Minister emphasized that the judgment affirmed by three courts is being referred to. “They had been entitled to the help of a lawyer, and they had advocates to defend them throughout the whole proceeding. Also, there was an open-door policy at the trial for every mass media representative, and any details on the process were being published. The court makes no distinction between Sunnis and Shias. It treats an offence, a breach of order, determines a judgment and a sentencing,” claimed the Minister of Defence. There are probably two intriguing aspects in this interview. 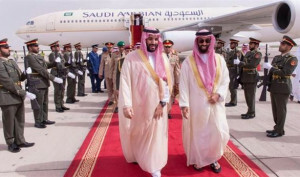 Firstly, the recent increasingly active efforts to bring the Defence Minister Mohammed bin Salman Al Saud to the forefront as the voice of Riyadh. As a reminder, according to the Saudi hierarchy, he is only the third person in the country, being the second heir apparent, while the heir apparent is Muhammad bin Nayef Al Saud, who is to topple the Saudi throne. And it is he who is supposed to make the basic principles of the kingdom public, in case the ill senile king is not capable of doing that. But advancing the Minister of Defence and the current king’s son to the fore implies that there is some power contest inside of the ruling clan, and it remains to be seen who will become the next King of Saudi Arabia. At any rate, the king’s son is in charge of military activities in Yemen, manages terrorist groups in Syria and, not least, commands the army which might support him at the crucial moment. Secondly, the Defence Minister has taken a firm stance of Saudi Arabia that is not yet to start an armed conflict with Iran. Up to a point, it is a shift from previous bellicose rhetoric with statements of taking any moves, including military ones, against Tehran. However, this should come as no surprise, since the Saudis, having overestimated their power, are gradually losing ground. Run by the king’s son himself, the military campaign against Yemen is not very successful. The air raids of Saudis and their mercenaries were followed by Yemen rebels launching missiles, thus pushing the war into the ground phase. Moreover, there were military activities in those Saudi border regions, whose population has indicated their willingness to side with Yemen. Needless to say, Saudi news media conceal their own and their allies’ military losses, while neutral Arab and Iranian news media shed light on significant losses of Saudis. The Syrian affairs of Saudis are also somewhat in a mess. The civil war had been unleashed at the instigation of Riyadh, and, being well funded by the Persian Gulf monarchies, mercenaries from terrorist groups of al-Qaeda, Islamic State, Jabhat al-Nusra, and others emerged in Syria. The report on the death of Zahran Alloush, the leader of the radical group Jaysh al-Islam, caused hysterical reaction in Saudi mass media. He was killed during the air raid on the field headquarters of rebel militants near Douma, a city in the vicinity of Damascus. The fly mission has resulted in 90 rebel fighters, including 20 warlords, dead or wounded. The Lebanese TV channel Al Mayadeen informs that the meeting at the field office was held together with representatives of another large militant group, Ahrar ash-Sham, and was aimed at creating the joint operations command near Damascus in order to withstand the upcoming attack of government forces more efficiently. Based on the foregoing, many experts believe that it is Zahran Alloush who was the key figure of the Saudi plan on ousting B. Assad from power. As many world and Arab media report, Riyadh and particularly Mohammed bin Salman Al Saud are currently clueless about what to do regarding the Syrian problem. By the way, it was the Syrian opposition conference in Riyadh at which Jaysh al-Islam representatives were appointed as members of the Higher Committee on Negotiations designed to coordinate the dialogue with the government delegation in Geneva early in this year. When it rains, it pours: another ill of Saudi life is a dramatic weakening of the country’s financial position. For decades, Saudis were living a hard roller, and have got used to buying domestic peace and foreign “admiration” of numerous states for large amounts of money. Now it has radically changed, and Saudis, due to the ill-thought policy of pushing oil prices lower, are starting to cut costs and be bearish about the future. The son of the king himself admitted that the era of high oil prices has come to an end, and the old level can be regained only decades hence, if at all. As the Saudi government gets approximately 90% of the revenues from oil production and export, slumping oil prices have caused heavy shock of national economy, and the budget deficit has spiked to 15% of GDP. A small, but a very painful “revolution” has begun, comprising cutting of government expenditures, raising of water and electricity tariffs, and increase in taxes for the largely pampered population. By the way, the 2016 budget has been projected with the 87 bn USD deficit. Compared with the current year, the kingdom’s revenues will shrink by 25 bn USD, and the expenditures — by 36 bn USD. The country’s government anticipates the new decrease of oil prices, so the budget will probably be overhauled. Reasoning from the financial straits, the government is going to fill the holes in the budget by selling Saudi Aramco after privatizing this Saudi state oil company through IPO (initial public offering). Saudi Arabia can sell a fraction of shares from the fully state-owned asset, as Mohammed bin Salman Al Saud, the Defence Minister and the second heir apparent, revealed in the interview for The Economist on January 8, a. c. Saudi Aramco can make the IPO at one of bourses and raise capital from a wide range of investors, but the particular algorithms are still being developed. The prince, having noted being underwhelmed by this idea, has already held two meetings on the IPO with the kingdom’s leaders. If the prince’s IPO plan will work out, Saudi Aramco will become the most expensive publicly traded company, ahead of Apple (market capitalization of 537.6 bn USD) and the most capitalized oil and gas company — ExxonMobil, 310.9 bn USD. All the above reasons provide clear evidence of Riyadh having a thin time and of its overseas initiatives crisis, as well as of drastic fall of living standards in the country. When the Arab Spring scraped against the Persian Gulf countries, the erstwhile Saudi King mollified public anger with enormous expenditures of 170 bn USD. Will the current King, or, rather, his son Mohammed bin Salman Al Saud be able to find such amount of money now? Under current conditions, the Saudi rulers seem to have decided to use the proven method of tightening their citizens’ belts and uniting them against a fictional external threat. Many things indicate the desire of Saudi government to use this conflict with Iran to wreck the two most important projects on enhancing stability and ensuring safety of the Middle East — solution of the problem of the nuclear program of Iran and peaceful settlement in Syria. In his speech in Cairo, the UAE minister of foreign affairs Abdullah bin Zayed Al Nahyan named, among other complaints against Iran, Tehran’s aspiration for normalization of relations with the West, instead of its regional neighbours. Yet another confrontation with Iran seems to stem from the fact that Iran’s regional competitors are wary of the US being no more interested in “containment of Iran,” and Europe often even has a liking for Iran. Victor Mikhin, corresponding member of RANS, exclusively for the online magazine “New Eastern Outlook“.